often don't know where they'll find their next meal. Nationally, 41 million Americans struggle with hunger, including 13 million children. Every day, families living in food deserts don't know where they'll find their next meal. We live in the world's greatest food-producing nation, yet men, women and children in our own cities and towns struggle to get enough to eat every day. Because of a lack of access to affordable fresh produce, many who are able to provide food for their families are forced to make unhealthy choices. We address these critical problems by offering multiple food services, including food pantries, mobile food distribution, lunch and dinnertime community meals, and summer lunch programs for school-age children, ensuring that people of all ages get the healthy, delicious food they need. Our food pantries serve low-income and homeless individuals and families, offering canned and baked goods and fresh fruits and vegetables. 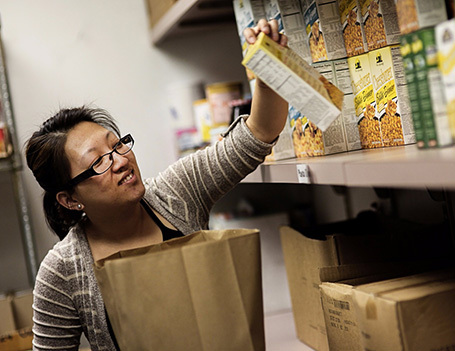 We fill more than 100,000 grocery orders each year, ensuring that men, women and children across Nebraska, South Dakota and western Iowa can gather around their tables for a nutritious meal, rather than go to bed with an empty stomach. 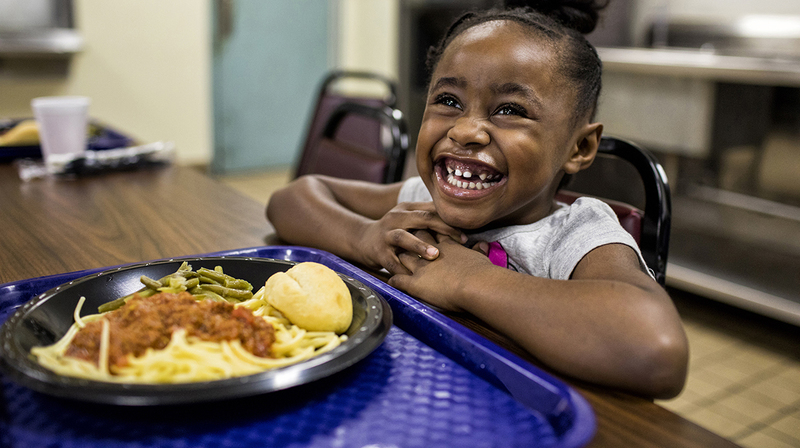 In cities, towns and rural communities across the Midwest, people who might not otherwise know where they'll get their next meal gather to enjoy free, nutritious lunches and dinners at our community meal programs. Many, especially older adults who often struggle with loneliness and isolation, benefit not only from the food, but from the social connection with friends and peers as well. Because the homeless and hungry are especially vulnerable during the harsh winter months, our mobile food distribution program Winter Night makes multiple stops at areas where the homeless congregate to distribute a warm meal and a hot beverage to anyone in need. Our summer mobile lunch program Kids Cruisin' Kitchen distributes nutritious lunches to school-aged children who might otherwise go hungry during the summer months when they don't have access to a free or reduced school lunch program. You can help cure hunger for those in greatest need. Your gift of can help provide to someone in need. Children are especially vulnerable to hunger. A donation to The Salvation Army feeds children in your community. Hunger is both an urban and a rural problem. A donation to The Salvation Army provides food to the hungry in cities, towns and rural communities. The homeless and the hungry are most vulnerable during the harsh winter months. A donation to The Salvation Army supports mobile food distribution programs, which offer help and hope to the people most in need of a meal.